Argus Heating stock and distribute an extensive range of G6W series Otter thermostats and safety cut-outs. Ex-stock models range from 2°C to 85°C. Otter thermostats are sealed (IP64) and have a robust glass reinforced polyamide body. ‍Rating: 240VAC 13(5) Amps, 24VDC 11 Amps. Tolerance +/- 2-5°C, differential 5-10°C, auto resetting. Available with Normally Open (NO) or Normally Closed (NC) fine silver contacts. Sealed (IP64), compact, 27mm long x 14.5mm wide x 5mm thick with 80mm leads, robust glass reinforced polyamide body. 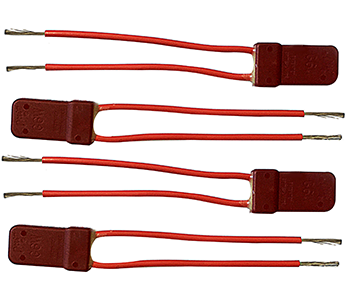 Thermal cut-out for motors, transformers, heaters, wiring harnesses etc.